UPDATED 11AM PST: Check the bottom of the post. Chris Daniels teased us for about 24 hours when he tweeted that he would have an exclusive interview with Hansen to get an arena update and talk NHL first scenario. I am told by someone who was in meeting, #NHL great Jeremy Roenick is in town, kicking tires on #SeattleArena. He wants to lead group. I’ve always thought that one of the biggest hurdles locally would be hammering out an agreement with Hansen and the potential NHL group. From the cities perspective, the first tenant should not matter as long as the terms remain the same. 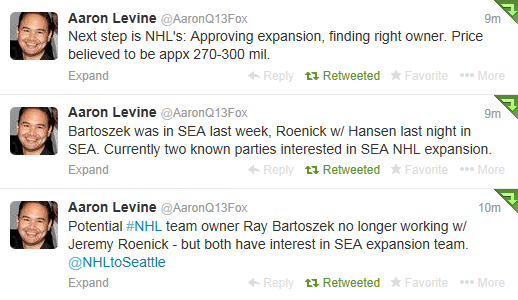 Being that Hansen made the intro of Bartoszek/Lanza Group to the Mayor & JR was rumored to part of that group, I think it is relatively safe to say that discussions appear to be going well on the Hansen-NHL group front. Apparently JR is part of a separate ownership group interested in brining a team here, not the Bartoszek/Lanza group that we has allegedly part of in June 2013 as part of the Coyotes “Plan B”. This is probably a good thing to help our odds with the team. Now they have two groups that are potentially bidding on Expansion team and Hansen now has two groups that he can try to come to terms with on his side of the deal. How this ends up is anyone’s guess but I for one would be ok with either ownership group. There is no way JR is a principle investor here so who those other parties are remain to be seen. Hang on boys and girls, this should get interesting.